Albacore Tuna can readily be identified by the following: the pectoral fins are very long running past the second dorsal fin, there is a white rear margin on the tail fin, the first dorsal fin can be lowered into a groove on top of the body. 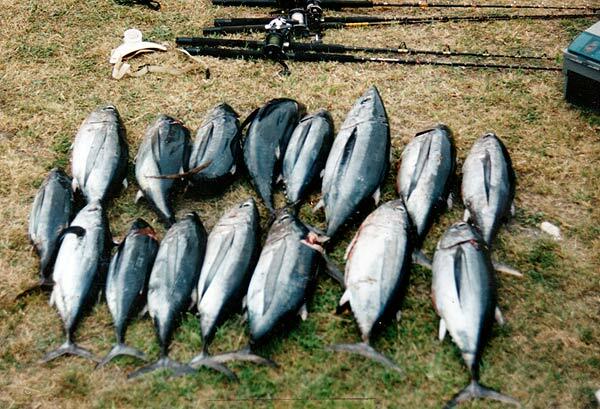 Most albacore tuna caught around New Zealand weigh between 3 and 10kg, can grow up to 55kg. Most albacore tuna measure around 50 to 80 cm in length and weigh around 4 to 5kg. Large specimens can reach 130 cm in length and weigh as much as 55kg. The most notable feature of the albacore tuna is the pectoral fin which extends back beyond the second dorsal fin. The pectoral fin has a long strap-like appearance. Albacore are taken mostly around northern New Zealand. They are also taken as far south as Fiordland and Banks Peninsula around March and April. There are good fishing grounds for albacore off Kaikoura in late summer; although the albacore tuna schools are usually found well offshore perhaps ten kilometres out. Some years they come in much closer. They are usually caught by trolling but will take just about any lure when near the surface. The water temperature needed for tuna needs to be around 18 deg C in summer. From about January through to May albacore tuna can be caught off the Kaikoura coast. Some years they show up later than others. In good years they can be caught right in close to shore. In other years you might have to go out ten miles or more offshore to catch albacore. They have at times been caught as close as 500 metres off the Kaikoura Peninsula. In this article, we look at the trolling methods and lures used to catch albacore tuna. This big albacore tuna was caught trolling off the Kaikoura Coast. Rebecca Dore with a big 9.5kg albacore tuna taken off the Kaikoura Coast. Darryl French with a brace of albacore. Sometimes called “chicken of the sea” for it’s fine eating qualities. Trailer boat owners wishing to catch albacore off Kaikoura need to develop a network of informers to send out the signal when albacore have been spotted off the coast. You can do this by talking to fishing club members, tackle store people and commercial fishermen. Some years albacore come in closer to shore when they are following baitfish. Other years you will need to fish 10 miles offshore for them. They also more around to some extent dependent upon water temperature though this species of tuna is more forgiving of cooler water than some others. The one thing albacore do prefer is clear dark blue almost black water of the open ocean. You will generally not find albacore tuna in greenish or discoloured inshore waters. The water far out to sea off Kaikoura is a typical black colour. The upwellings from deep water support abundant sea life of many kinds. There is a very significant groper and ling fishery offshore, and plenty of blue cod and moki to be caught right along the coast. Over the summer months, there are many fish species that come to call at Kaikoura. These include schools of jack mackerel, kahawai, barracouta, dogfish and yellow-eyed mullet. Many blue sharks are attracted to the rich pickings as are makos and threshers. This albacore tuna took a trolled high-speed Mighty Mackerel Mauler. It is the albacore tuna that most anglers love to catch on rod and reel. These torpedo-like speedsters are actually attracted to boats by the prop wash. Indeed some fishermen even tow old car tires and the like to cause a surface commotion that mimics a school of frenzied baitfish being worked from above by sea birds. Trailer boat anglers can tilt their outboard motors to create excessive prop wash for a similar effect. Another ploy used by commercial fisherman seeking albacore is to squirt water onto the surface of the sea with high-pressure hoses to attract the fish. 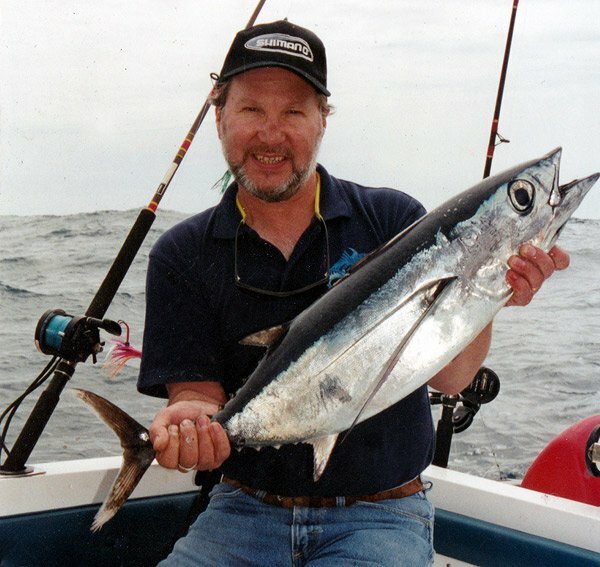 Many times albacore tuna will take your lure right in very close to the boat. When you catch one albacore there are always plenty more close by even if you can’t see them so it pays to keep trolling. Multiple strikes are common with this species. Albacore will often follow the hooked fish to investigate what’s happening! A fully rigged albacore Lead Head Muppet lure. These lures are straight runners. This makes it easier to set a pattern with many lures out at once. There is less danger of them crossing when turning! 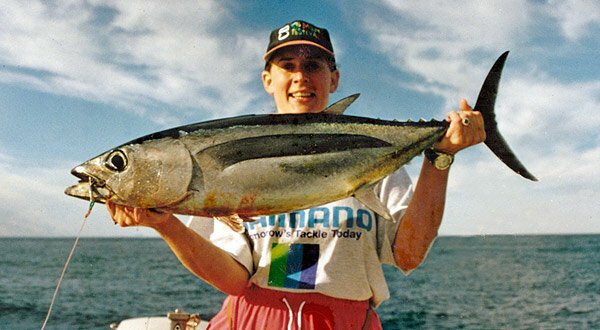 Most albacore are taken on trolled lures. Commercial Hex Heads are popular with recreational anglers. Hex Heads are made from brass and typical have small red plastic eyes which are said to be particularly attractive to albacore tuna. Many other lures are also good for taking albacore. 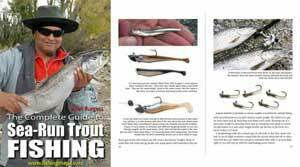 The main thing is to use strong 4/0 hooks and keep them very sharp. Other successful lures include Yo-Zuri Squid, Rapala CD Magnums, Mackerel Maulers, and a wide variety of soft plastic lures, and skirted lures made up with lead heads. The one thing most of these lures have in common is that they are designed to be trolled at quite high speed. Typically albacore tuna lures are trolled at around 10 knots so most lures used are straight runners. 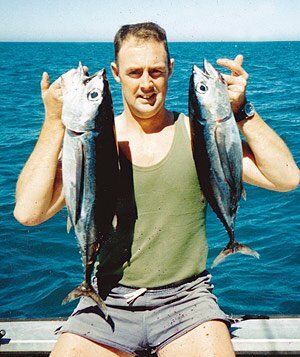 Christchurch angler John Butler, of Butler Marine, with an albacore tuna taken off the Kaikoura coast. The best albacore trolling lures are bright and glittery. You want a lure that really stands out. The idea is to bring the tuna up to the surface. The more commotion you can create the better. Another old trick is to tow an old car tire behind the boat to create a bit of excitement perhaps imitating a school of baitfish being attacked by predators! It has been said, that once albacore are excited, and “buzzing” around your boat, they will take any sort of lure you care to toss over the side. Commercial boats create “excitement” on the surface by squirting jets of high-pressure water on the surface of the ocean. The albacore tuna take this for a school of bait fish, and they come up for a look. Once near the surface commercial fishermen take them on simple hex-heads and feathered lures fished at the end of a long pole. Good haul of albacore tuna taken off Kaikoura by club members. Note the pectoral fins with their long strap-like appearance. Experienced anglers prefer to stay away from bibbed minnows like the Rapala CD Magnum because although they work well for trolling at high speed, and are very good for taking albacore tuna, they have a tendency to cross over other trolled lines particularly when turning. This isn’t so much of a problem with only a couple of lures out the back. I have been told horror stories by several very experienced tuna anglers who have witnessed some awful tangles caused by trolling multiple bibbed minnows; like the CD Rapalas. A selection of colourful unrigged soft plastic lure skirts known as muppets. All you need are some lead heads, beads and hooks to make up inexpensive yet highly effective albacore tuna lures. The best tactic when targeting albacore is to get as many lures out at once as you possibly can to create your own “fish school.” With say 6, 8 or even 10 lures out, in a staggered pattern, straight runners like skirted lead heads are a safer bet for avoiding tangles. You don’t need super heavy gear for albacore tuna. Typical 15kg gear is fine. Reels such as the Shimano TSM4, Shimano Calcutta 700, Penn 320, and the like spooled with 25 – 30lb mono is all you need. Though nowadays most anglers prefer to use braid. Each fish will take quite some time to subdue on light gear. You can easily take an hour to get each fish into the boat. You could also fish even lighter if you wanted but you’ll be there all day! Generally, albacore are taken fast trolling at say 10 knots. However sometimes when you find yourself in the middle of “worked up” fish you can cast to them on spinning tackle. This species is caught off Kaikoura. Such fish would weigh in the region of 5 – 8kg and measure around 60cm in length. A really big one might reach 30 kg and measure almost 1.5m. Albacore tuna have long pectoral fins. They are very long in relation to the size of the body. In fact, the pectorals are the longest in this regard of any of the tunas. Some really good info on tuna fishing techniques here at Coastside Fishing Club, Napa, California. Coloration is blue/black above with the lower sides and belly silver/grey. Its most distinguishing features are its large black eyes and its long sweeping pectoral fins which are the longest in any tuna in relation to its body size. The Albacore averages about 50 – 7Ocms in length and 5 – 8kgs in weight. Big specimens have been known to reach 1.4 meters and attain a weight in excess of 30kg. The albacore is one of the most cosmopolitan of all the tuna species with its range extending right throughout the world in both tropical and sub-tropical seas. Here in New Zealand, it is to be found in both Islands where it forms the basis for a large recreational and commercial fishery. The commercial catch alone extracts over 1000 tonnes of albacore annually from our local populations and although the recreational catch is insignificant in comparison they are still the most likely catch for anglers of all the tuna species present in our waters. In the South Island, we have two main fishing areas for this species. They are available along the entire west coast from Fiordland North whilst, a smaller population is located in the waters off the Kaikoura coastline. Both these fisheries are what is known as summer fisheries with the Tuna stocks moving out into deeper waters over the winter months. The Kaikoura stocks, for instance, are to be found in deep waters out over the Chatham rise throughout the cooler months of the year. From a recreational anglers point of view the albacore is the most regularly encountered of our tunas with both the South Island fisheries producing good numbers of these fish yearly – although as is the case with most of our South Island tunas the majority of the fish taken are unfortunately caught on tackle which does not allow them to exhibit their true fighting abilities and a scaling down to lighter line would certainly enable them to display their wares. As a rule, albacore generally will keep most anglers busy for an hour or more. Most South Island Albies are caught whilst trolling although at times they will take jigs, dead baits and occasionally flys – although at this point I believe this has yet to be achieved in the -South Island. At the time of writing, all of the New Zealand fly-rod caught albacore records so far have all been taken out from Whakatane and with our good populations of Albies down this way there is certainly plenty of scope for someone to, with a little planning take one of these fish on the fly, and find their way into the national record books. As far as rigging up for albacore is concerned I won’t go into any detail here as there have been some excellent articles on this subject already. Check out the article by Allan Burgess Rigging Albacore Trolling Lures – Muppets, Hex Heads, and Hook Selection – It’s all there. Things to watch out for whilst trolling for albies are areas of current movement, upwellings, current lines, working birds and items like logs or kelp floating on the surface. It is amazing how many times we have encountered albacore schools while trolling past small insignificant pieces of flotsam drifting along in the current. Sometimes a small log or piece of bull kelp will hold an entire school of albacore tuna in residence and many are the day that our only fish taken have come from beneath such unlikely items. Another key to finding albacore consistently comes in the form of water clarity. Generally, albies will be found in the cleanest water around. Water temperature is not so important but if you’re targeting Alberts the rule of thumb is to seek out the cleanest, deepest indigo blue water in the vicinity, and the tuna should not be too far away. A pair of skirted but un-rigged Hex Heads. They are ideal for albacore in the smaller sizes 150mm (6 inches). These lures are used by United States commercial albacore fishermen. Trolling speeds for albacore are fairly fast with most boats almost up on the plane. Some anglers tilt their outboards right out of the water whilst trolling in an effort to increase the amount of white water at the back of the boat. The theory behind this being that albacore are attracted the noise and aerated water from the passing outboard and will come up from deeper to investigate and hopefully come within visual range of the trolled lure pattern. Albacore schools are not frequently seen or the surface and often strikes seem to come out of the blue. This is primarily due to the fact that albacore school vertically rather than horizontally, and thus only a few fish – if any will be seen on the surface. This is totally opposite to a school of barracouta, mackerel or kahawai which may have a very large proportion of its total numbers visible at any given moment in time. Once an albacore is hooked it will tend to pull others from the school up into the trolling pattern so it pays to keep the boat motoring ahead after the first rod goes off. In that way, multiple hook-ups can be achieved out of one school thus giving several anglers on board a chance to land one of these exquisite eating fish. See: Slender Tuna – Allothunnus fallai – the most elongate of the South Island tuna species also by Gary Wilson.